Faster than a speeding bullet! More powerful than a locomotive! Able to remove a bottle cap in a single bound! 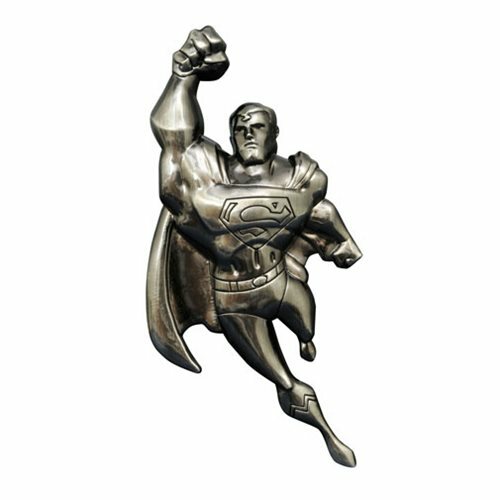 Draw on the strength of the Man of Steel with this solid metal bottle opener in the shape of the Superman himself, as he appeared in Superman: The Animated Series! Like Superman himself, this 4-inch long opener can bend metal and remove bottle caps with ease, and two magnets on the back allow it to float on your refrigerator until it's time to swoop in and save the day! The Superman: The Animated Series Figural Metal Bottle Opener comes packaged in a full-color slipcase. Ages 13 and up.